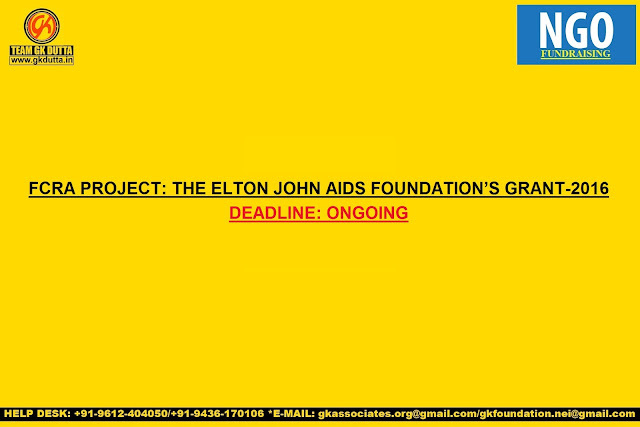 The Elton John AIDS Foundation (EJAF) accepts grant applications for its different kinds of grant programs. One of them is Robert Key Memorial Fund. The applications for these grants can be accepted anytime with no specific deadline. The foundation seeks to fund frontline programmes that help to alleviate the pain – whether physical, emotional or financial – of those living with, affected by or at risk of HIV/AIDS, and to continue the fight against this worldwide pandemic so that no one is left behind. Grants are open to organisations that can demonstrate an immediate, tangible benefit for individuals living with HIV. Up till now, the Foundation has supported 1,359 projects with total grant award £80 million. Applications will be considered for awards of up to £10,000 per year on a rolling basis and may be for single or multi-year programmes. Botswana, Cameroon, Cote D’Ivoire, Democratic Republic of the Congo, Ethiopia, Ghana, Kenya, Lesotho, Malawi, Mozambique, Nigeria, South Africa, Tanzania, Uganda, Zambia, Zimbabwe, China, India, Indonesia, Myanmar, Thailand, Vietnam, Russian Federation, Ukraine and the United Kingdom. Applicant’s organization must operate in one of the programme countries mentioned above. Proposals must be for a specific project and demonstrate a clear need for support.